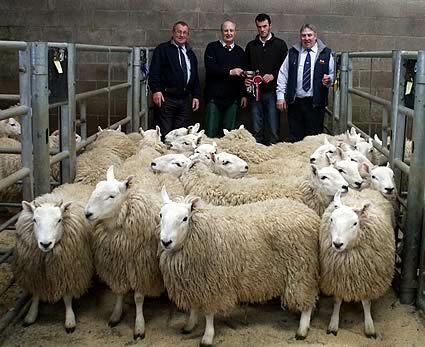 The Cumberland & Dumfriesshire Farmers Mart held their Weekly Primestock Sale in Dumfries On Wednesday 21st March 2012. 23 Prime Cattle – Trade looked sharper. Greater numbers of butchers and commercial spec cattle required. Included in the sale were 21 pens of Cheviot hoggs for the Annual Prize show & Sale on behalf of the Cheviot Sheep Society. The Judge Mr C Anderson awarded the Championship to Messrs A Reid & Co, Glendearg, Eskdalemuir for a pen scaling 45Kg and selling for £104 to the Judge. The Reserve award went to Messrs JT Fleming & Son, Falnash, Teviothead. Results of other classes. All classes of hoggs met a sound trade with 38-42Kg quality sorts scarce of requirements. Top price per Kg was 242p for an outstanding pen of Cheviots from RJ Menzies & Co, Chanlockfoot. Overall sale average was 210.8p. 283 Cast Ewes & Rams forward – more fleshed ewes forward. Lighter ewes looked dearer on the week.